PADDINGTON the livable British bear that wears a trench coat, Wellington boots and red hat, returns with another big adventure. The first (2014) PADDINGTON film was wonderful and made a whole lot of money. PADDINGTON 2 also directed by Paul King has already been released worldwide grossing $134 million and nominated for Best British film for the this year’s new BAFTA (British Academy Film and Television Awards) to be hosted by Joanna Lumley, who also has a cameo in PADDINGTON 2. 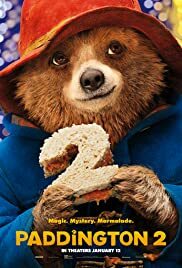 PADDINGTON 2 is live-action/CGI animated comedy film directed by Paul King and written by King and Simon Farnaby, based on the stories of the character Paddington Bear created by Michael Bond. The film is dedicated to Bond. Ben Whishaw provides the voice of Paddington, with Imelda Staunton the voice of Aunt Lucy. The story involves Paddington, who is now settled with the Brown family in Windsor Gardens. Paddington has become popular in his community, offering people emotional support in various ways. In order to purchase a unique pop-up book of London in Mr. Gruber’s antique shop for Aunt Lucy’s 100th birthday, Paddington performs several odd jobs and saves his wages, but the book is stolen, and the culprit escapes, resulting in Paddington being accused of the crime and arrested. Although Mr. Gruber (Jim Broadbent) does not believe that Paddington stole the book, with no evidence that the thief existed, Paddington is wrongfully convicted and jailed. Besides the known Paddington characters , the script includes two lively new ones. One is the villain of the piece, Phoenix Buchanan ( a price performance by Hugh Grant), a faded and narcissistic theatre actor now doing doggie food commercials looking for a comeback. He steals an antique pop-up book that Paddington wants to buy as a birthday present for her Aunt Lucy while framing Paddington in the process. His performance is camp, funny and totally winning. Make sure you sit for the entire closing credits as Grant performs his musical number in prison after he credits roll. As Buchanan sys, “This is a success because of the captive audience.” Grant won a BAFTA nomination here for Best Supporting Actor. The second lively character is Nuckles with a capital N. It is in prison that Paddington befriends many of the inmates, including the short-tempered chef Nuckles, who hires Paddington, impressed by his marmalade sandwich recipe. Paddington is at first warned by all the inmates about Nuckles but Paddington insists that there is some good in everyone, as Aunt Lucy says. The inmates respond that it is obvious Aunt Lucy has never met Nuckles. Irish actor Brendan Gleeson who has proven himself apt at both drama and comedy is perfect as Nuckles, who proves himself finally a worthy friend to the bear. PADDINGTON has all the ingredients of a solid family film with good values, humour, with and excitement. The climatic train segment with a chase on top of the train is both fun, clever and exciting. Everyone proves his worth, including Paddington’s adopted father, Harry Brown (Hugh Bonneville). It is also great to see Sally Hawkins as Mary Brown. Hawkins is always goodie anything and her expressive words and smile brings additional charm to the film. 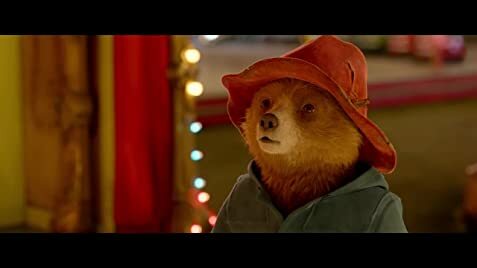 PADDINGTON 2 is a total delight from start to end.